Since many strategic plans are nothing more than budget-driven, out-of-touch, unused slide decks with the relevance of a Sear’s catalogue, leaving them on a plane isn’t a bad idea. But, any manager that believes “it’s all about execution,” should be kicked off that plane at the comfortable cruising altitude of 32,000 feet. You can have the most technologically advanced aircraft flown by a competent pilot (execution), but if the plane’s flight plan (strategy) has it running into a mountain range, great execution only helps you crash faster. Has your business changed much in the past year? Compare your strategic plan from the previous year to this year’s plan. How much difference in strategy, resource allocation and insights do you see? Not much. Why? Most likely because there wasn’t any new thinking involved in the creation and evolution of the plan throughout the year. Great strategy doesn’t come from a company, division, business unit or functional group. Great strategy comes from great thinkers–managers who generate new insights, anticipate customer needs, and execute effectively. When is the last time you devoted 60 minutes to pure thinking about your business? 1. Schedule. You’re busy. I’m busy. We’re all busy doing stuff. Problem is, some of the stuff we’re doing doesn’t make much sense and adds no value. The first step is not putting think time in the calendar. The first step is assessing the areas and amount of time you currently spend. Take the least valuable activities on the list and cut those time investments by 50-100%. Then, the most common excuse I hear, “I don’t have any time to think strategically,” is no longer true. Now, put time in your calendar on a weekly basis for thinking and label it whatever makes sense for you. 2. Frame. Think time is not code for fuzzy slippers, white wine and Kenny G music in the background, although now you have a plan for Friday night. Think time is most productive when you have questions and frameworks to stimulate your thinking, whether it be individually or in a group. If you facilitate meetings/teleconferences and you don’t have productive thinking frameworks to guide your session, there’s a good chance people believe you’re wasting their time. And they’re probably right. 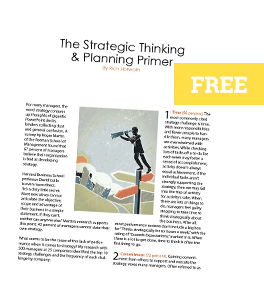 There are more than 40 strategic thinking tools you can use individually or in a group to stimulate and frame thinking about your business. 3. Record. In research for my past few books, I noticed that one of the common traits of the great contributors throughout history (da Vinci, Einstein, Gates) was the discipline to write down their ideas. Writing down your ideas and then reviewing them over time gives you the advantage of being able to see patterns and trends that others don’t. It’s impossible to connect the dots (insights) if you don’t have any dots to connect. Chances are somebody in your market is investing time to think about the business. Is it you, or the competition?